Peugeot’s new 508 is shorter, lower and weighs around 70kg less than its predecessor. It’s also switched from a conservative saloon bodystyle to a five-door fastback, to take on Audi’s A5 Sportback and appeal to a younger customer in their early 40s. Such a dramatic transformation makes it worthy of a proper getting-to-know-you drive. Not over a year in Provence but certainly four days, where we’ll admire the region’s cultural treasures and explore its beautiful outdoors. It’s a chance to meet the country that made the car. As we leave Nice, mercury rising to 34˚C, the Peugeot’s great indoors seems the most sensible option. It helps that we’re testing the high-grade GT trim – Active, Allure and GT Line sit beneath it – and immediately the interior feels both high-quality and elegant. Retail prices start from £25k, stretching just over £37k; business and retail customers will be able to lease a 1.5-litre diesel from just under £300 a month. The GT’s instrument panel sweeps across in one long, horizontal section, the visual bulk stretched wide and low and emphasised with its sleek air vents, elongated digital display and shelf-like middle. 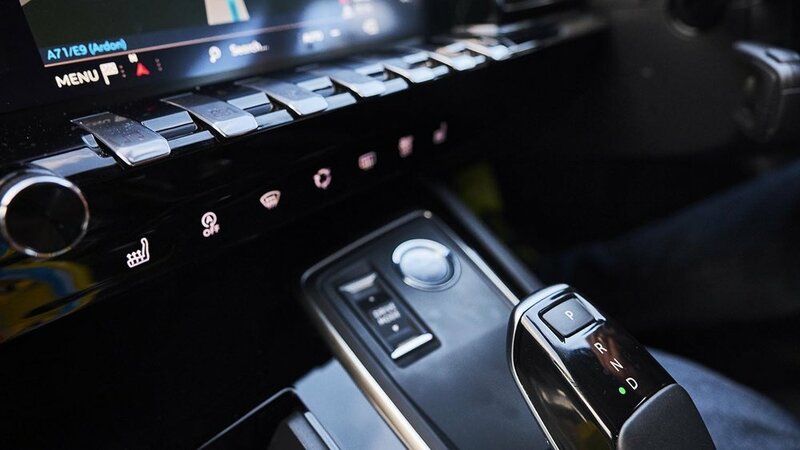 In its centre sits a 10-inch capacitive touchscreen, with satin-chrome piano-key-like shortcuts arranged beneath so you can make like Jean-Michel Jarre, and below that switches for the heated seats, fan and window de-mister. The ‘floating’ centre console rakes up to meet this, the automatic gearlever offering a pistol-like grip. Material quality feels good, from the dashboard’s woven carbonfibre-effect strip to the soft-touch plastic on the upper section (it’s not leather, despite suggestions otherwise from the twin stitching that secures it), though the steering wheel is most definitely trimmed in soft leather. We head east along the A8, sunshine streaming through the windscreen. You notice the gentle but controlled lull of the suspension in the Comfort setting of the adaptive dampers, the calm of the cockpit at a 70mph cruise and, well, the steering wheel. A wheel so tiny it would feel more at home on a go-kart. It soon feels natural, though I suspect a larger diameter would be more relaxing over an entire country. At least it doesn’t obscure the dials like it did for some drivers of earlier Peugeots. The seats are fantastic: finished in full-grain nappa leather with double stitching, they provide a likeably low-set driving position with support and comfort, and our car’s indulgent ‘cat-paw’ massage function quickly feels essential. I’m not daft enough to trust the active-cruise and lane-keeping assist systems and climb into the back for a nap, but if I did there’d be enough legroom for 6’1” me but no excess headroom. And behind that, a large boot offers 487 litres of space – a fraction more than a BMW 3- and 4-series. After 12 miles, we head into Monaco, and the reality distortion begins with a Lamborghini Huracan and Audi R8 firing out of the péage ahead of us like greyhounds from the traps. Peugeot has history round these parts, whether it’s Ari Vatanen celebrating victory in the 1985 205 T16 rally car or Martin Brundle taking second at the 1994 Monaco GP in his Peugeot-powered McLaren. Today, we’ve got rather less firepower with a 2.0-litre turbodiesel engine, but it’s spot-on in congestion the F1 circuit hasn’t seen since the ‘Trulli Train’ was in town. The 508 is impressively quiet at idle for a diesel, cuts out automatically as you coast to a halt (and restarts equally promptly), and lugs strongly from next-to-no revs with 175bhp and all 295lb ft on board from a relaxed 2000rpm. That it steers with delicacy and lightness, shifts gears smoothly and generally rides well adds to the easy-going nature around town. There are lesser diesels to choose from (a 1.5 HDi with 129bhp, a 2.0 HDi with 160bhp), but Peugeot offers a 1.6 petrol with either 179bhp or 221bhp too. All except the lowliest diesel get an eight-speed auto as standard. We run the kerbs at the Grand Hotel hairpin, hit 30mph through the tunnel while making loud neeoowww noises and have to abort a brave manoeuvre at the casino when a man in a security hat waves furiously and almost stands on our bonnet, set deliberately low to facilitate the sporty seats and low dash. It’d seem ridiculous for F1 to race here if they didn’t already. 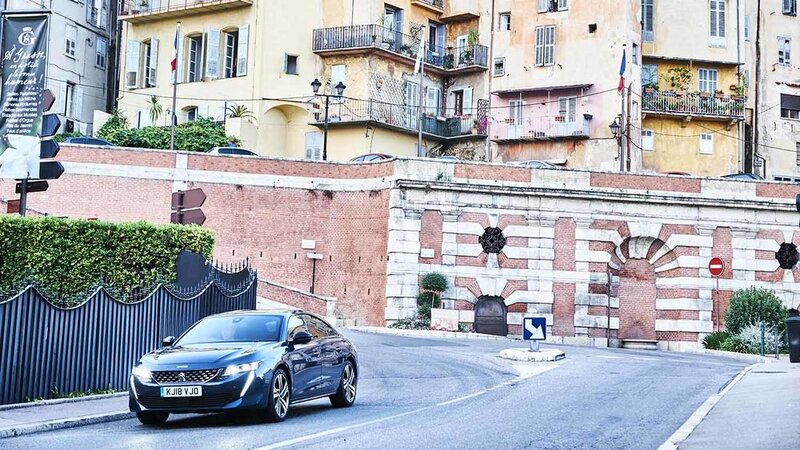 Gold Bentleys and fuchsia Rollers roam around, but for all the glamour and excess, heads really are being turned by a Peugeot saloon. People point, glancing back enthusiastically – ‘cinq cent huit’ I see them mouth to friends; they’re clearly interested to see such an important new model from the neighbours. We even confidence-trick our way onto the harbour front for some static photography. I think the front overhang is a bit long, but the arcing silhouette, and the low, wide stance get the basics right, and there are some dramatic details too: particularly the concave front grille and the ‘fangs’ that cut down from the headlights, the crisp lines that recur in the bonnet and the roof, and the origami-like complexity that runs from the bootlid into the body side. It’s brave and bold, certainly more desirable than the previous generation. A few hours later it’s time to fight the Monaco traffic and head west to Grasse, famous as the home of parfum thanks to its warm climate, large jasmine harvests and abundant Alpine water supply. Grasse’s rustic streets also happen to be base camp for the Route Napoleon, that most epic of French roads. Not that we need a detour to find a dynamic challenge for the 508. Our overnight stop is in Tourtour, and the road there appears to harbour more roundabouts than Milton Keynes. Every couple of minutes the sat-nav chants ‘roundabout, second exit’, and they provide some early indications that the 508 is dynamically adept: nimble, grippy, well controlled in the way it contains its roll. Perhaps that shouldn’t be surprising seeing as it updates the EMP2 platform that my much enjoyed 308 GTi rode on, albeit with the 508 benefitting from a bigger wheelbase and a switch from torsion beam to a more sophisticated multi-link rear. So I’m already getting into a rhythm with the 508 when we’re directed down a minor road on the approach to Tourtour. It’s a proper Tarmac rally stage of a road, a never-ending stream of flicks and compressions that flow while the adaptive LED headlights flash over Armco and tree trunks that are incentive enough to keep it on the black stuff. I switch the drive-mode toggle to Manual, and shift gears via the paddleshifters that are – quite unusually in this segment – fixed to the steering column; this mode also makes the damping firmer. The 508 isn’t trying to be a sports car, but it’s fluid, composed and reluctant to understeer too on its Michelin Pilot Super Sports, the steering is light and quick and provides reassuring feedback when you load up the suspension, and when you throw a turbodiesel four with eager torque into the mix you can maintain the kind of fast but also calm momentum that gets you cross-country quickly, but on speaking terms with your passengers. Out of interest I try Sport, which takes much of the compliance out of the ride and reverts to an aggressive auto gearbox; I prefer the Manual mode. Next morning we strike out for the Gorges du Verdon, a mini-Grand Canyon with a European accent that’s more verde in both its foliage and the turquoise of the river that carved it. We stop for pictures at a bridge that spans Lac de Sainte-Croix, its cobalt blue surface contrasting sharply with the crumbly earth around its perimeter, and the primary-coloured inflatables and canoes that holidaymakers float idly on. High summer isn’t the best time to explore the roads that snake off around the mountains, but wind back the pace a little, accept that you’ll have time to enjoy the views and it’s like driving through the most beautiful landscape painting. Talking of paintings, our destination tonight is Arles, which inspired one of Vincent van Gogh’s famous street scenes. We head out of the national park, and the landscape quickly unfurls. It’s here, over this fast but lulling topography that the 508’s suspension really starts to make light work of a long journey. It’s on conventional coil suspension with adaptive dampers, but you could mistake it for air springs: in the Comfort setting, it just breathes with the landscape, sometimes compressing a little more than expected, like sinking into a particularly comfortable armchair. It feels luxurious and relaxed even on the largest 19-inch alloys – which are probably a visual must – yet there’s no sloppiness to the rebound damping, no frequencies building up and threatening to make it all feel wayward. On the outskirts of Gordes, we make a detour to Senanque Abbey. The Cistercian monastery is a haven of peace and tranquillity, and should probably get the 508 on its company-car fleet given its similarly relaxed feel. It’s a beautiful place: nestled in a valley, the abbey’s parched brickwork looks almost like a matchstick model in its monochrome uniformity, the lavender fields in front offering welcome contrast. The monks founded this place in 1148, its Romanesque architecture including beautifully minimalist cloister arcades, a calefactory and scriptorium, all of it now preserved almost 900 years later for modern visitors to enjoy… or not. ‘Over-rated’, ‘very small’, ‘only do tours in French’ noted one critic on TripAdvisor: ‘three stars’. Which seems to miss the point. As well as liking God, the monks seem fond of law and order: ‘No drones, we call the police’ reads one sign; ‘No trespassing, we call the police’ announces another, both in English, which is either testament to the reach of la langue, or a damning indictment of the people who speak it. In the gift shop, expensive crucifixes, monitored by CCTV, are sold. We leave empty-handed, reaching Arles by nightfall. The 508’s i-Cockpit lights up with copper-coloured accents (which you can switch to blue), and I scroll through the various configurations for the digital instrument binnacle. There’s probably too much choice for my tastes and I’m not totally sold on the operating logic, with all manner of ways to display revs and speed and driving info, but it’s useful to have the sat-nav projected up there when you’re threading through an unfamiliar city centre, and the copper-banded dials add sophistication. We’re hoping to recreate van Gogh’s famous Café Terrace at Night painting through the 508’s windscreen, but the narrow streets are protected by pop-up bollards that Vincent definitely didn’t have to faff about with in 1888. After a recce to Place du Forum, it looks impossible, but I dust off my A-level French and chat with the nice lady attending to front-of-house. Press a button, she says, the bollards will drop from 9-10am. As promised, the barrier vanishes into the street the following day, and we roll into the little courtyard, dodging delivery trucks and French types who seem to either love the car or find it absolutely disgusting that we’re clogging up the place. The older fellow who runs the van Gogh cafe seems lovely, all genuine smiles and of-course-you-can-take-pictures nonchalant shrugs. The painter would still recognise the café: the yellow awnings, the surrounding buildings, and his paintings are all over the place, though I guess none would wash on Antiques Roadshow. From Arles, it’s time to make some headway back towards Calais, but not before we’ve taken in the incredible Millau Viaduct. The bridge took three years to complete and was opened in 2004 after a joint project between Brit Sir Norman Foster and French structural engineer Michel Virlogeux. A mile-and-a-half long, it helps link the A75 from Clermont-Ferrand to Béziers in the Massif Central and boasts the highest road-bridge deck in Europe – it even unseated the Eiffel tower as the tallest structure in France. As we approach we see its seven vast pylons spearing the sky, mist lingering beneath its deck that spans the River Tarn, and cable-stays stretched taut like a harp’s strings filling our windscreen; it’s like a toll road straight into heaven. We pull off the A75, thread our way underneath the bridge and climb out of the car with our necks cranked back like we’re looking at a 747. It’s a beautiful structure, one that not only spans the vast gorge, but enhances it too. You’ll struggle to say that of many stretches of motorway. With Millau ticked off, it’s time for a big push across France. We average 40mpg at a high-speed cruise, swapping stints like Brabham/Gené/Wurz at Le Mans in 2009, and if we interrupt the journey short of the 400-mile-plus fuel range it’s only because of our bladders. 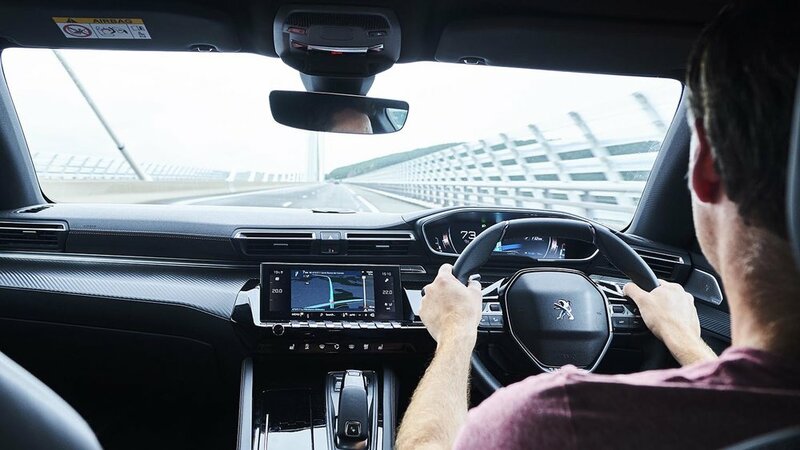 By the time we get off the Eurotunnel and immediately become stuck in UK Friday traffic, we not only know France quite a lot better, but the Peugeot 508 too. As Peugeot intended, it’s an executive car with a more pronounced identity and yet, bar a few small quirks, it’s not wilfully different. Instead, it offers likeable differentiation from the default choices with its smooth ride, elegant design and stylish cabin. This one doesn’t deserve to get lost in translation in the UK.